The Greek island of Rhodes in the Dodecanese island chain in the Aegean Sea is one of the grand dames of the tourist circuit in Greece. 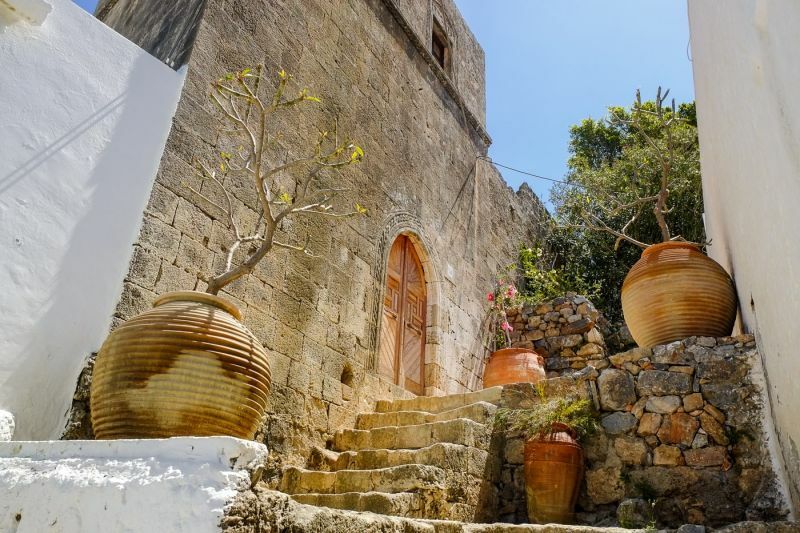 With blockbuster historic sites, sandy beaches and pretty villages, it’s no wonder that Rhodes is one of the most popular destinations in Greece. As well as the showstopping medieval city, the rest of the island has a great mix of things to do and one of the best climates in the Mediterranean. Little wonder it’s so popular. Get the lowdown here on the island’s vibe, beaches, food and drink, unmissable sights, activities and hidden gems. 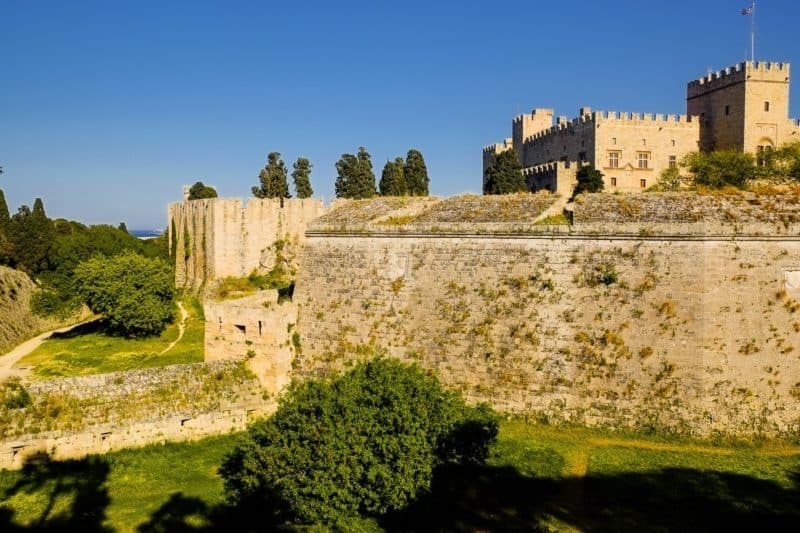 Here’s how to find the best of Rhodes – both on and off the beaten track. 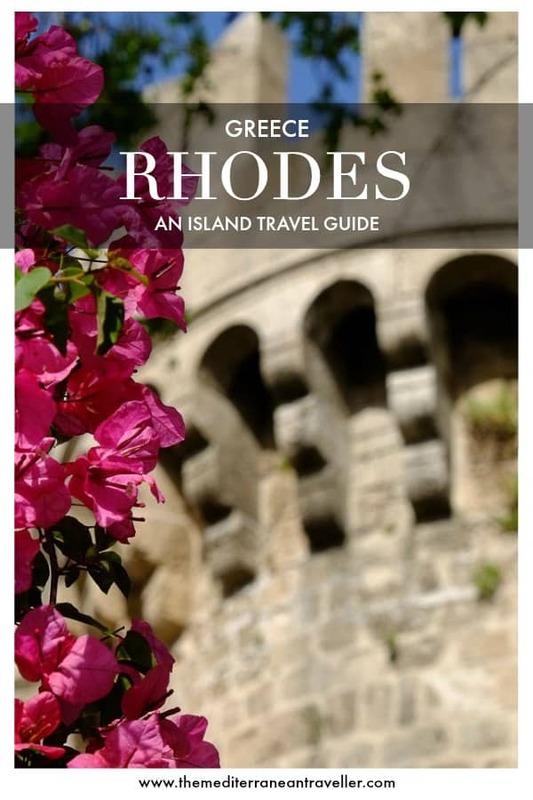 Rhodes is the third largest Greek island, but still a manageable size so you can explore it in one day. Synonymous with the Crusades, it was occupied by the Knights of St John from 1309 to 1522. 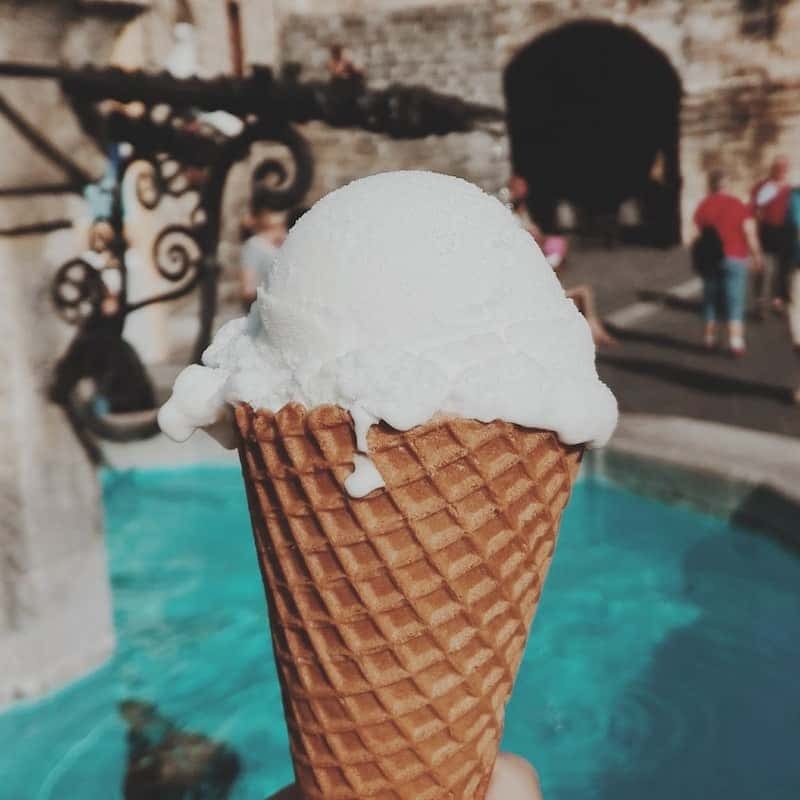 The extensive medieval walled city that they left is one of the best preserved (and largest) in Europe and the star attraction here, but there are castles dotted around the island too. Lindos is the other highlight; an immaculately maintained elegant whitewashed town with an ancient acropolis and lovely beaches. The Swedes and the Brits popularised package tourism here in the 1960s and there are still plenty of both here today alongside the cruise ship passengers who pour in. If the name ‘Rhodes’ brings to mind the seedy resort of Faliraki and its worst excesses then don’t worry, the notorious behaviour confined to the one resort and has calmed down a lot in recent years. It still has a lively nightlife but also has a large family-friendly beach. The crowds and the heat in July and August can be brutal. May and late September are perfect. Rhodes one of the most southerly islands in Greece and has one of the longest tourist seasons – the sun is still shining into late October. Lindos has its own little microclimate which makes it one of the best places to go for autumn sun in Europe. The east side of the island is scrubby but punctuated with great beaches. This is where you’ll find the main resorts. There’s another cluster on the other side, nearer to Rhodes Town. The west side of the island is steeper and heavily wooded. Beautifully shady, the smell of pine resin hangs in the air. Head to this side of the island to escape the crowds and the heat, and for stunning sunsets with the Turkish coast on the horizon. The south of the island is windswept and quiet, popular with kitesurfers. If you’re renting a car take a clockwise loop from Rhodes Town. When I first visited UNESCO World Heritage-listed Rhodes Town, island hopping as a teenager, I found it hot, dusty and exotic. The Byzantine bustle of the Old Town, flanked with palm trees and dotted with minarets, seemed to have more in common with the bazaars of nearby Turkey than the Greek islands. These days it seems tidier and more sedate. Perhaps it’s because I’ve travelled widely since then, or perhaps its been tarted up for the cruise ship crowd. I suspect a bit of both. The centre of the Old Town is filled with trinkets and souvenir sellers, and dodgy-looking cafes with photo menus. The backstreets streets are a joy to wander, though. 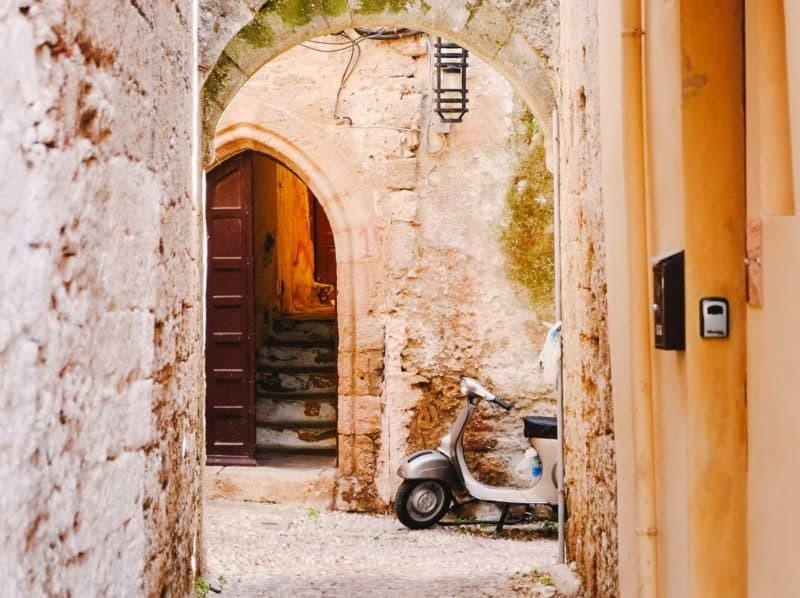 As with any labyrinthine town, you can always find a quiet spot (try the Jewish quarter). There are swirls of Byzantine and Ottoman history, churches beside mosques and hammams, . Don’t miss the walk around the outside of the city walls 4km – it’s refreshingly green and serene. Crusader history is the key thing here on Rhodes, which was the main base from which the Christian West attacked the Ottomans. The Palace of the Grand Masters of Rhodes is one of the main points of attraction within the walled Old Town. The Gothic construction was various points it was a citadel of the Knights Hospitaller, a palace, and a fortress, an Ottoman command centre, and a holiday residence for Mussolini. The old city was reconstructed by the Fascists during Italian rule from 1912. Much was done to modernise and set out the town plan (it was intended by the Italians and architect Florestano Di Fausto to be a tourist attraction). They encouraged greenery and fountains, turning the cemeteries outside the walls into a green zone for walking. The result is it feels more restored than other Greek sites. After the Italians came the Germans, who were then starved and bombed out by the British during WWII. Rhodes is also a university town with year-round inhabitants, and it’s the administrative capital of the Dodecanese islands. This makes it one of the better islands to visit off-season as it doesn’t completely shut down. The commercial centre of Rhodes Town, with high street shops, banks, pharmacies, is just outside the medieval walls. Towards the beach, you’ll find newer hotels as well as eateries and bars. The rest of the city has a fairly workaday feel and you’re unlikely to head that far in unless you’re looking for something specific. What you won’t find is the Colossus of Rhodes. One of the original ancient wonders of the world, the Colossus was a monumental bronze statue of the sun god Helios built in 302BC. An earthquake in 226BC brought it toppling down. For centuries it lay as ruins and parts were probably sold off by marauders. The Colossus is reputed to have been either on the harbour or underneath where the Grand Palace now stands. Unless you’re looking for a beach stay or somewhere quiet, there’s no need to look anywhere other than cosmopolitan Rhodes Town which has the best selection of accommodation. Hotels and rooms in the Old Town unsurprisingly command a premium. For the sumptuous medieval vibes check out the Marco Polo Mansion, Spirit of the Knights or Nikolis Hotel. I like the boutique rooms in beautifully restored Kokkini Porta Rossa. For cheaper rooms or better value look in the New Town. The wonderful STAY Hostel (I booked for 3 nights and ended up staying 3 weeks) is the best hostel I’ve ever stayed in and the mattresses are amazingly comfortable. 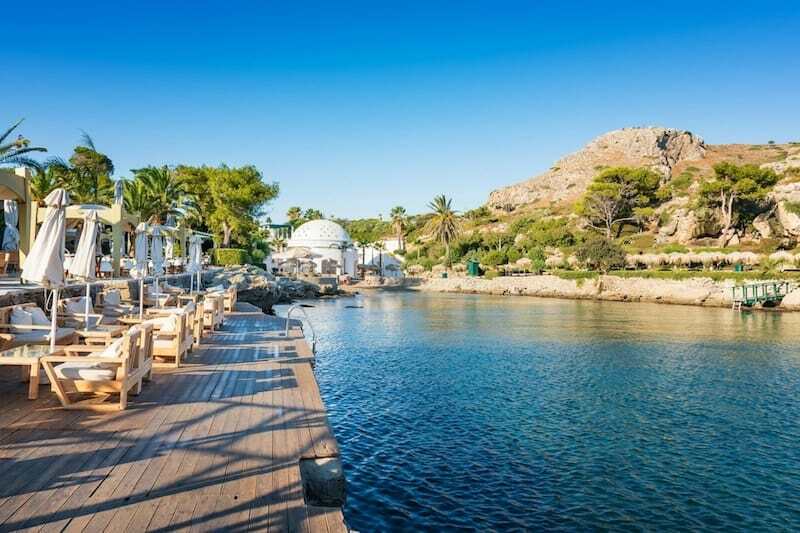 The main string of resort towns is located from Rhodes Town down the eastern coast to Kolimbia and Afandou, with a further cluster near Lindos (Pefkos and Lardos) which is over an hour in the car (a bit longer on the bus). The popular resorts and tourist attractions are well connected by bus to Rhodes Town. Lindos is one of the most romantic destinations in the Greek islands and has plenty of upmarket hotels ideal for couples. Lindos Blu is cream of the crop. And recent arrival Casa Cook in Kolymbia is the most appealing boutique hotel. On the other side of the island, Sentido Ixian does adults-only luxury. Nearby Pefkos is perfect for a low-key package holiday. Check TUI for UK packages to Pefkos and Gennadi. Bargain-basement deals are more likely to be found at mega resort Faliraki. Rhodes is blessed in terms of natural resources so there’s plenty of good stuff here. But be warned: you’ll have to go looking for it. There’s plenty of tourist slop in Rhodes Town. The proliferation of cruise ships means that much of the restaurant food in the Old Town veers towards mediocre and overpriced. Take the time to talk to locals and find out where they eat. I dined well at Koukos and Nireas in Rhodes Town. If you’re looking for cheap eats, join the students at Ovelix. Foodies – don’t miss a meal at Mavrikos in Lindos, one of the best restaurants on the island. Try the local wines at well-stocked (though slightly snooty) wine bar Cellar of the Knights in the Old Town. Out of season, be aware that some businesses will only open for the hours that the cruise ships are in town. In terms of traditional dishes, you’ll find an eastern influence as well as the typical Greek taverna fare, particularly in the use of cinnamon, bulgar wheat, chickpeas, raisins. Pitaroudia – chickpea fritters – are a local speciality. The island produces excellent thyme honey and several varieties of wine. You’ll find the wine region in the area around Attavyros and the village of Embonas on the western side of the island. Rhodes was one of the first Greek islands to establish viticulture. The main grape varieties are Athiri and Mantilaria. Emery is the main winery open to the public, but I recommend calling ahead to check it’s open before heading there (it was closed when I visited). You’ll need a car or to take a private tour – it’s difficult to do in a day by public transport. Greece Is magazine has articles on Rhodian wines and traditional foods if you want to know more, and there are a few leaflets on the wine trails at the Tourist Information Centre. Keep an eye out for moustalevria – a traditional pudding made from grape must. Wash it down with a glass of souma – the local pomace brandy. Rhodes Town. The main beach at Rhodes town is pebbly and gets deep quickly, with a few beach bars. The water is a sharp turquoise blue – it’s ideal for a quick dip if you’re staying in town but you probably wouldn’t want to spend all day there. The beach to the west of town is are wavey and popular with dog walkers. Kallithea. Not so much a beach, but there is some great rocky swimming and cliff jumping at Kallithea Bay and beach bums will love Oasis Cave Bar. The Springs themselves have sunloungers. And nearby Tassos Beach is lovely too. Anthony Quinn Bay. This beautiful rocky cove is popular with day-trippers who come on boat trips. Lindos. 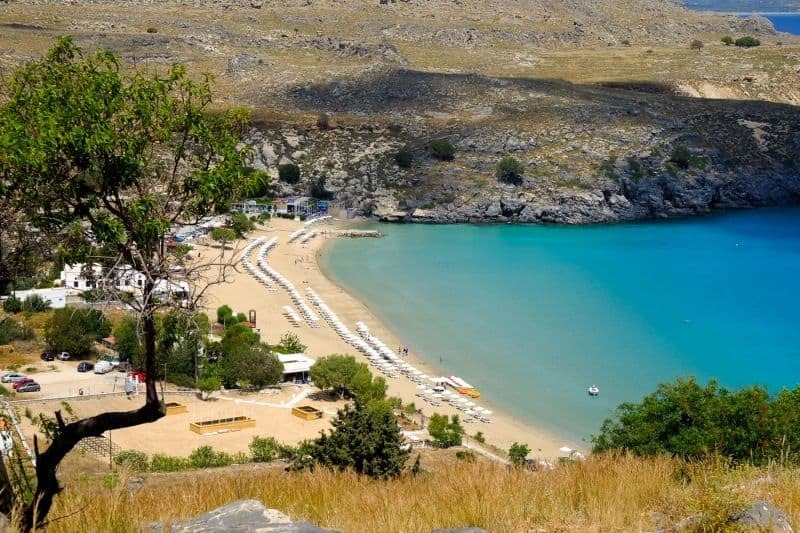 There are several classy, small, organised beaches in Lindos. Sunloungers, beach bars and restaurants are present. And the incredibly picturesque St. Paul’s Bay is just behind the town. Quiet resorts Pefkos and Lardos are around the corner. Tsambika. Beautiful big sandy bay at Tsambika and down the east coast. No development here but it is organised in high season. The water is shallow and good for kids. Faliraki is the best beach. Has calmed down a lot recently. If you’re visiting before the package tours start (mid to late April) you’ll have it mostly to yourself. Stegna and Kolymbia. Two nice small resort towns which attract upmarket tourists. In the south of the island the beaches are windy and desolate, Prasonissi, on the southern tip, is one of the best windsurfing and kitesurfing spots in Europe. 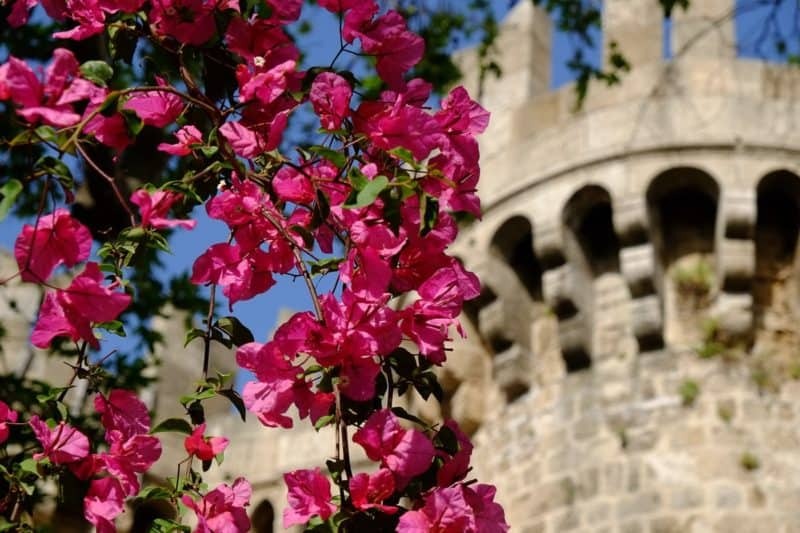 Rhodes Old Town is simply unmissable. If you’re into history then a walking tour will bring the city alive. Kallithea Springs A natural spring that Italians tried to turn into a health spa, the beautiful buildings and serene gardens still remain. Although the spa is no longer in operation, there’s a the bar/cafe and sun lounger on the rocks. EUR3 entry. Lindos. 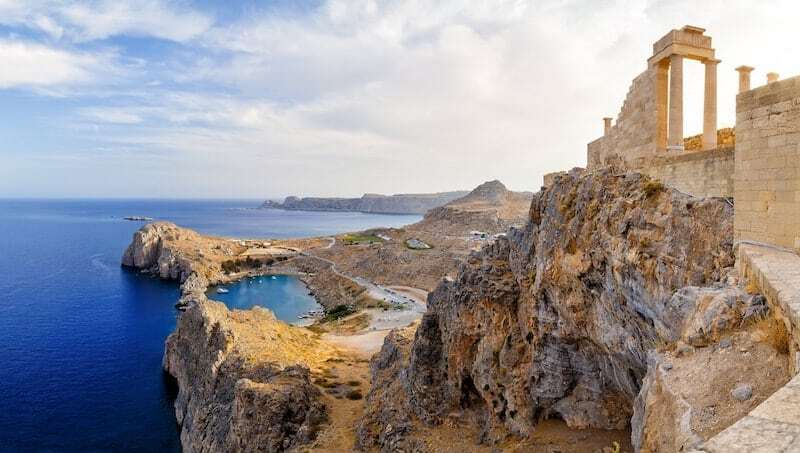 This stunning town is everything you could wish for in a Greek town: a clifftop Acropolis with ancient ruins, whitewashed Cycladic sugar cube buildings with enchanting backstreets, and sandy beaches with enticing seas. It’s small and doesn’t take long to explore and wander up to the Acropolis, but I recommend to take your bathers and make a day of it by settling round at St. Paul’s Bay. This is where Paul himself reputedly landed in 58AD on a mission to evangelise the island. Tsambika. A monastery on a hill with fantastic beach views. Don’t miss it if you’re driving past (be warned there are lots of steps monastery involved). There’s a local tradition that women wanting children climb on September 8th. 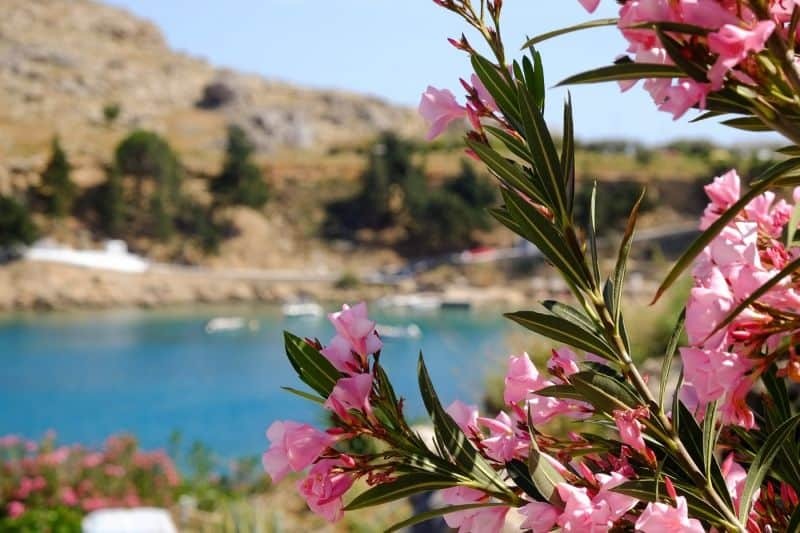 Anthony Quinn Bay is a popular day excursion for many holidaymakers on the island – take a boat trip from Rhodes Old Town. Valley of the Butterflies. June or July. red and black jersey tiger moths. Seven Springs. An inland brook with bubbling springs. Numerous excursions take in the springs along with the Valley of the Butterflies and Kallithea Springs, which are both nearby. Day trips. Take an excursion or hop on a ferry for your own DIY day trip to Symi, Chalki, or across to Marmaris in Turkey. In high seasons there are organised excursions to a wider range of islands. You can use Cruisemapper to check when ships are due in, this will give you an idea of how busy the island will be on any given day. It’s currently under restoration, but it’s worth mentioning that Rhodes Town has its own (mini) Acropolis on Monte Smith Hill (named after an English admiral) – with remains of temples to Athena and Zeus. The castles of Kamiros, Ialysos, Kritinia and Feraklos. Rhodes Town also sports an Archaeological Museum (at the foot of the Street of Knights) which contains the Aphrodite Adioumene statue. Also in town is the Museum of Modern Greek Art. Profitis Ilias. Beat a retreat from the heat to this lush mountain for cooling wooded walks and discover an abandoned villa that was once destined to be Mussolini’s pleasure palace villa, then became a sanatorium. Monolithos. 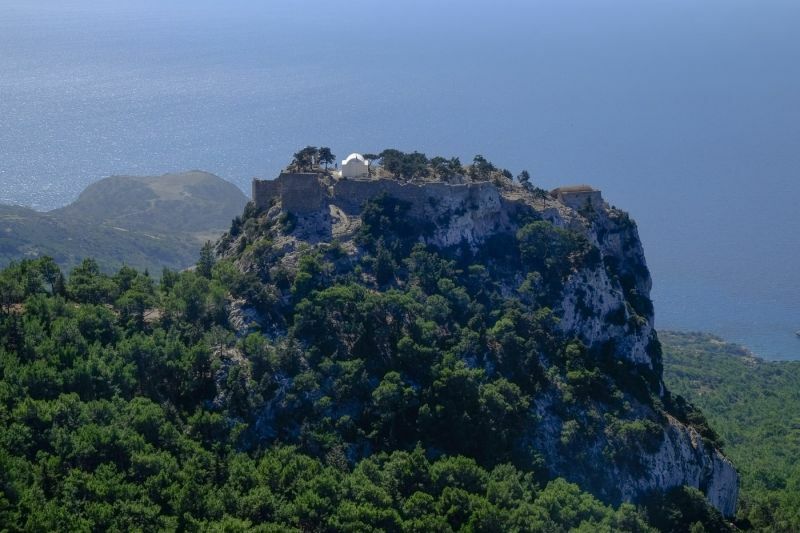 Incredible views over the west coast from this fortress and church perched atop a huge rock. No entry fee. Akramatis. The second highest mountain of Rhodes is another great hiking spot. Head up to Fileramos Monastery for noisy peacocks and spectacular sunsets over Turkey in the distance. Rhodes Diagoras Airport is served by both domestic and international airlines. The airport 15km from Rhodes Town. There are frequent buses to Rhodes Town. Vehicles can’t enter the Old Town which is very cobbled. Be warned – 5 minutes on these cobbles wrecked my brand new rolling luggage (thankfully it’s Osprey so has a lifetime guarantee). Rhodes is one of the main ferry hubs of the Dodecanese and is well served by ferry connections. The main ferry port is a 20-minute walk from town. Local ferry connections are to Kastellorizo, Chalki, Symi, Tilos, Nisyros, Kos, Karpathos and Kalymnos. Longer connections include Athens, Crete, the Cyclades and Patmos. There are also international ferries to Marmaris in Turkey. The bus service is geared toward local provision, although the main tourist towns have frequent connections over the summer season. It operates on a hub and spoke system, with most routes radiating out from Rhodes Town. Timetables are available at the Tourist Office. Car rental is available airport or in Rhodes Town. The island is too large to explore by scooters and the roads are not ideal.